The adage goes that to be a decent writer, it helps if one is an avid reader. It was no secret that David Bowie, the galactic songwriter, loved to read. When asked by Vanity Fair’s Proust questionnaire what his idea of perfect happiness was, Bowie matter-of-factly answered: reading. A true innovator and dream weaver, Bowie created otherworldly personas complete with science fiction landscapes to accompany his well-written songs and musical concepts. His love of literature spans many genres and fueled some of his work directly and notably. Bowie’s 1974 concept album, Diamond Dogs, bridges Orwellian themes with his own glam-rock drenched character, Halloween Jack. While reading and revisiting the lyrics to his famous song “1984” from the above mentioned album, Bowie sounds off Orwell’s prophecies almost like a town crier of culture. 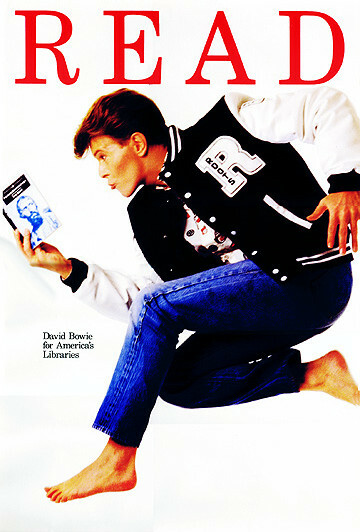 Bowie used his love of literature, reading, fantasy, and concept to reach out to his listeners in a unique way. He was informing his world-wide audience with great works, whether they knew it or not.